"Smooth Move" is the nickname of this moderate birth weight sire, and it's no wonder why. He is as sleek fronted as they come with smooth shoulders and a square topline and hip. An industry icon actually called Smooth Move the next Northern Improvement at the 2010 NWSS! Time will tell, but we definitely like what we see here! 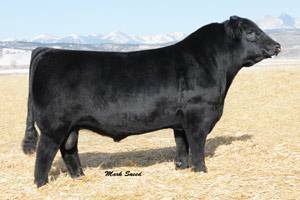 Styles & RMH Livestock own this great young sire. The calves are jet black and ultra hairy. Chris Styles says he is an Angus heifer bull.